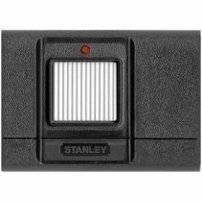 The Stanley 105015 one button visor remote is designed for garage door and gate operator applications. The Stanley remote uses a 10-position on/off coding switches to set the remotes code. The Stanley remote will only activate receivers set with the same code using the 310MHz frequency. This Stanley remote MCS105015 is not a universal remote and only works 310MHz systems.